Small volumes of anti-HEXA antibody vial(s) may occasionally become entrapped in the seal of the product vial during shipment and storage. If necessary, briefly centrifuge the vial on a tabletop centrifuge to dislodge any liquid in the container`s cap. Certain products may require to ship with dry ice and additional dry ice fee may apply. This gene encodes the alpha subunit of the lysosomal enzyme beta-hexosaminidase that, together with the cofactor GM2 activator protein, catalyzes the degradation of the ganglioside GM2, and other molecules containing terminal N-acetyl hexosamines. Beta-hexosaminidase is composed of two subunits, alpha and beta, which are encoded by separate genes. Both beta-hexosaminidase alpha and beta subunits are members of family 20 of glycosyl hydrolases. Mutations in the alpha or beta subunit genes lead to an accumulation of GM2 ganglioside in neurons and neurodegenerative disorders termed the GM2 gangliosidoses. Alpha subunit gene mutations lead to Tay-Sachs disease (GM2-gangliosidosis type I). Western blot analysis of extracts of various cell lines, using HEXA antibody at 1:1000 dilution. NCBI/Uniprot data below describe general gene information for HEXA. It may not necessarily be applicable to this product. HEXA: Responsible for the degradation of GM2 gangliosides, and a variety of other molecules containing terminal N-acetyl hexosamines, in the brain and other tissues. The form B is active against certain oligosaccharides. The form S has no measurable activity. Defects in HEXA are the cause of GM2-gangliosidosis type 1 (GM2G1); also known as Tay-Sachs disease. GM2- gangliosidosis is an autosomal recessive lysosomal storage disease marked by the accumulation of GM2 gangliosides in the neuronal cells. 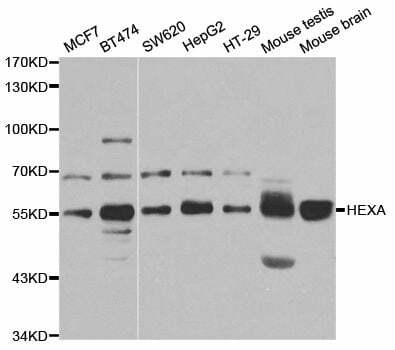 GM2G1 is characterized by GM2 gangliosides accumulation in the absence of HEXA activity, leading to neurodegeneration and, in the infantile form, death in early childhood. GM2G1 has an increased incidence among Ashkenazi Jews and French Canadians in eastern Quebec. It exists in several forms: infantile (most common and most severe), juvenile and adult (late onset). Belongs to the glycosyl hydrolase 20 family. 1. Human prostate cancer cells are characterised by a significant decrease in HexA activity.